Ah, the weekend.. tgif! Summer is my favourite season and Saturday & Sunday are my favourite days of the week. Put both of them together and I'm at total bliss. As long as the sun is shining and I don't have to do anything work-related, I'm good. Now that the most wonderful time of the year (aka summer) is here, I thought it'd be a great time to share some essentials. To me, summer is all about the sun beaming down on you and giving you warmth. It all sounds good until you find out you've got sunburnt. Sunscreen will always be an essential and the one I've been reaching for lately is the Shiseido Urban Environment UV Protection Cream* with SPF40 (that's a mouth full) to shield me from that. 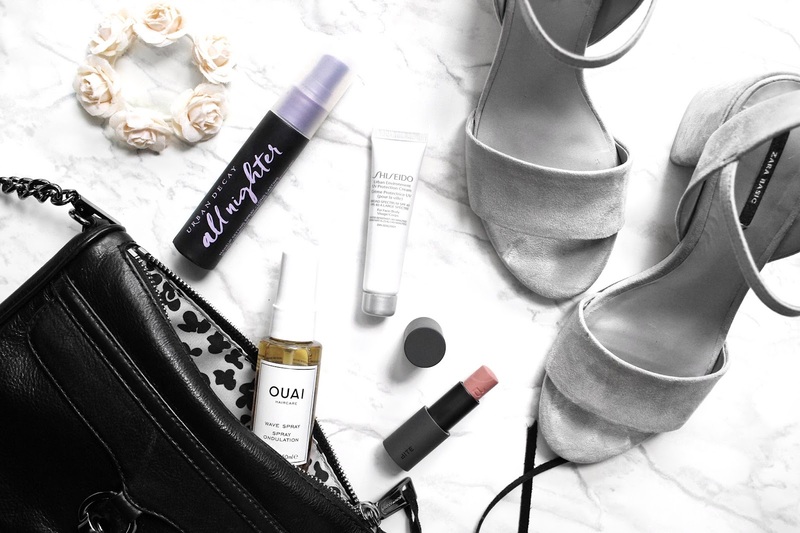 If I know I'm going to be outside for a while, I'll take along my travel size of the Urban Decay All-Nighter Setting Spray. Not only does it set my makeup to keep it lasting all day, but it also refreshes and cools me when needed. There are other cooling facial mists out there, like the La Roche-Posay Thermal Spring Water (which I really want to try), what are your guys' faves?! If there was one season that you wouldn't need to worry about your lipstick, I'd say it'd be summer. I know I can't be bothered when it comes to lipstick in the heat. I'll either reach for a lip balm or a very low maintenance lipstick, one that I could just throw on and not worry about. Recently, I've been using the Bite Beauty Multisticks for that. I'll use it as a blush, lipstick, and sometimes I'll even use it as an eyeshadow. These are so great and they're easy to just chuck into your purse and use it on the go. Speaking of easy, the Ouai Wave Spray is easily one of my favourites at the moment. I admit that I'm the worst when it comes to styling my hair so spraying this in my hair after getting out of the shower is a fast and efficient way for me to give my hair a bit of oomph. Plus it smells fricken amazing! Despite Fall being my favourite when it comes to fashion, Summer comes in extremely close after it. One of my go-tos recently have been bralettes. They're so comfortable to wear compared to regular bras. I have a couple lace ones and they're so airy and nice to wear on those hot days. Sometimes those warm summer days turn into cool summer evenings, so I find that a light cardigan fixes that. I get cold so easily and cardigans are literally the best because I could use it as a sweater or if my legs are cold, I'll use it as a blanket! Another fave of mine are comfy, but cute shoes. I've been wearing these heeled sandals from Zara (in photo) a ton lately. They're gorgeous and go with absolutely everything. Lastly, crossbody bags. Nobody wants to be hauling around a huge purse during their summer adventures and I find crossbodies to be the easiest solution. Just sling them over your body and forget it's there. What are your summer weekend essentials?